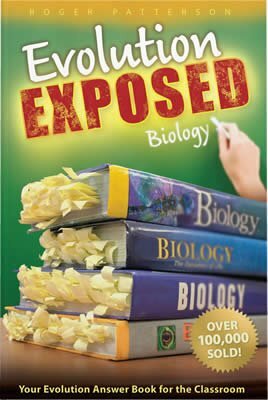 This book helps teens to discern the chronic bias towards belief in evolution that permeates today's three most popular high school biology textbooks. Virtually every chapter in each of the secular textbooks contains implied or explicit references to evolutionary beliefs, which are misrepresented as irrefutable facts. However, in Evolution Exposed: Biology these misrepresentations are cross-referenced with online articles and publications that provide both scientific and biblical answers. Key terms are defined, articles are summarized and false ideas are refuted. Challenge the world’s thinking on origins! A “survival guide” for biology class! This book helps teens discern the chronic bias towards belief in evolution that permeates today’s four most popular high school biology textbooks. Virtually every chapter in each of the secular textbooks contains implied or explicit references to evolutionary beliefs, which are misrepresented as irrefutable facts. However, in Evolution Exposed these misrepresentations are cross-referenced with online articles and publications that provide both scientific and biblical answers. Key terms are defined, articles are summarized and false ideas are refuted. Evolution Exposed is thoroughly indexed by topic so anyone can use it as a reference. Christian students are equipped and inspired to recognize and respectfully challenge evolutionary indoctrination (in class, research papers, and normal interactions outside of school). Using tables, web links, charts, and illustrations, documented facts that counter evolutionary teaching in a powerful and organized fashion are synchronized with each textbook’s sequence. Chapter 1 What Is Science?